Most Americans and Canadians set their clocks 1 hour forward on March 9, 2014 and move the clocks 1 hour back on the first Sunday in November. Check you smoke alarms and change the batteries if required. See article of Smoke Alarms"Change Your Clock - Change You battery"
Your forced air furnace filter plays an important role in maintaining the air quality in your home. Checking and replacing the furnace air filter is one of those chores most people know they're supposed to do, but few remember. 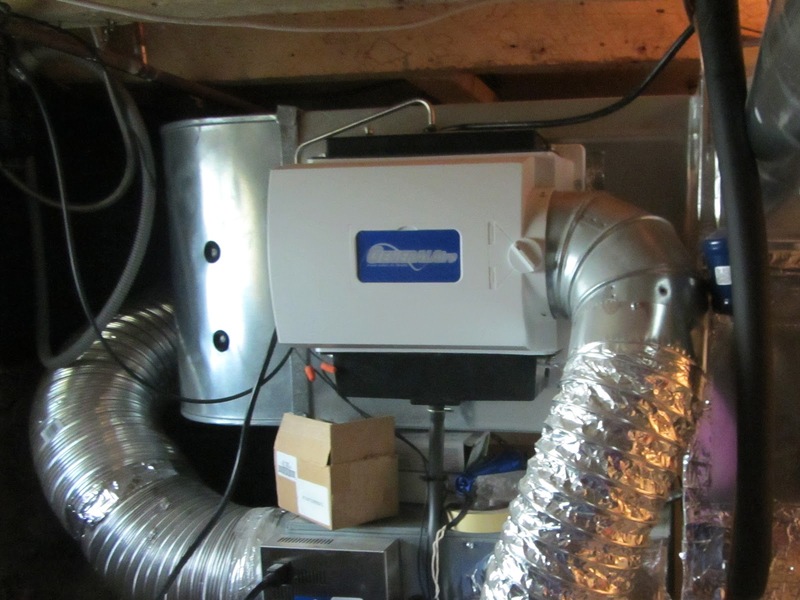 Check out the latest blog entry on Carbon Monoxide with a real experience with detecting CO. Check out the latest blog entry Smoke Alarms Save Lives! Check out this latest PDF of useful home safety information prepared by InterNACHI. 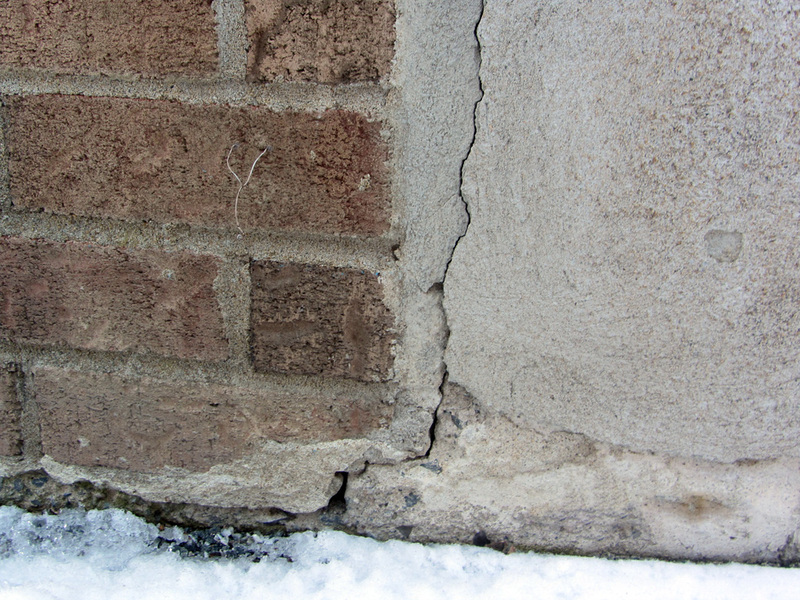 As mentioned in the Spring Maintenance tips, cracks in your foundation walls are easy spots for water to enter your home . Monitoring the condition of the cracks is necessary to prevent water from entering the basement. 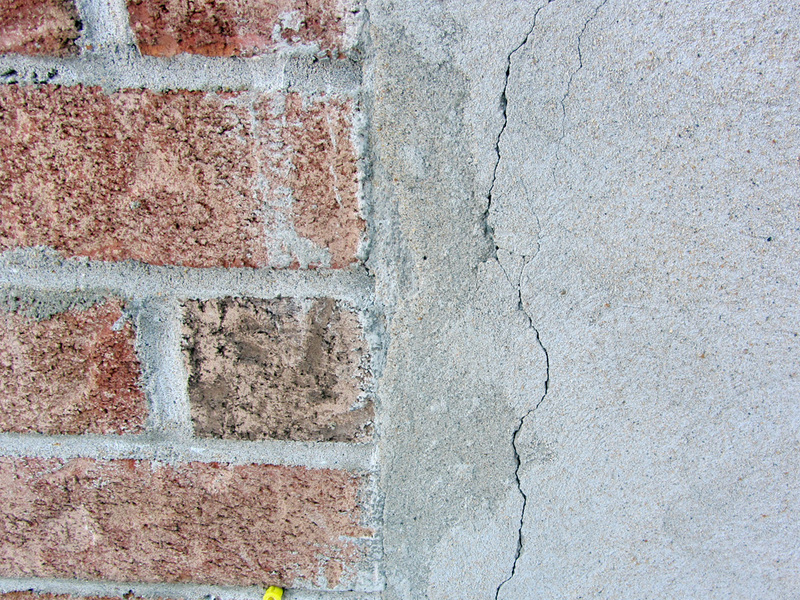 Minor cracks may seem harmless, but they can quickly become problems and can result in high repair costs. 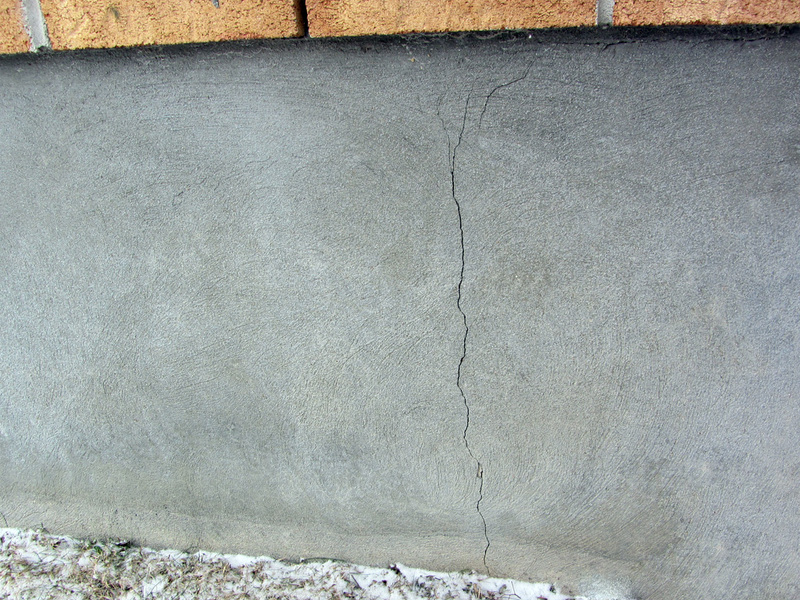 Larger cracks should be assessed and repaired as required by a professional. 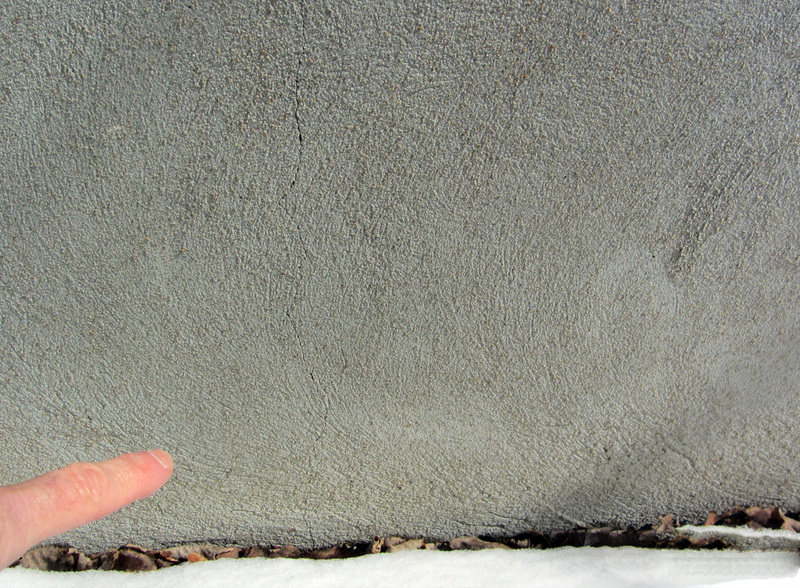 Inspect your foundation often and call a professional if the gap is larger or appears to be growing in size. 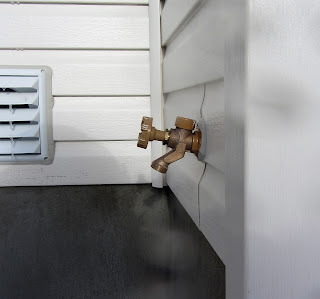 Inspect your downspouts and extensions. 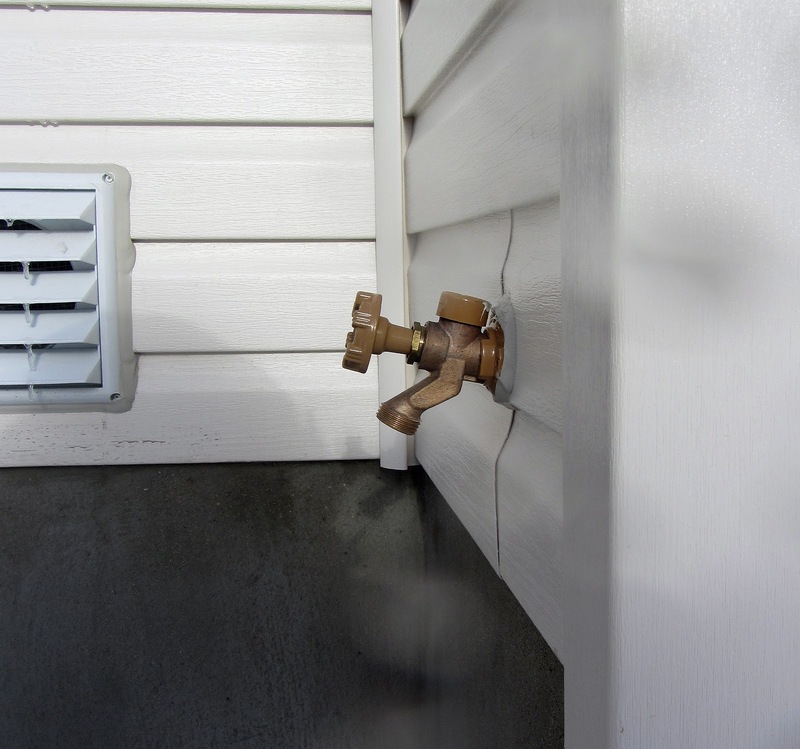 Make sure your downspout extensions will direct the water from your roof (4-6 feet) to the lawn and not along the side of your home near the foundation. When the water is being absorbed by the grass, it reduces the amount of water trying to penetrate through the foundation. Maintain proper lot grading. Always slope the landscaping along the side of your home towards the lawn or away from the foundation, that way there is less water trying to enter the cracks in the foundation. Maintaining/replacing the weeping tiles is another way you can deter water from entering the basement through the cracks. Mind you this is not an expensive task. 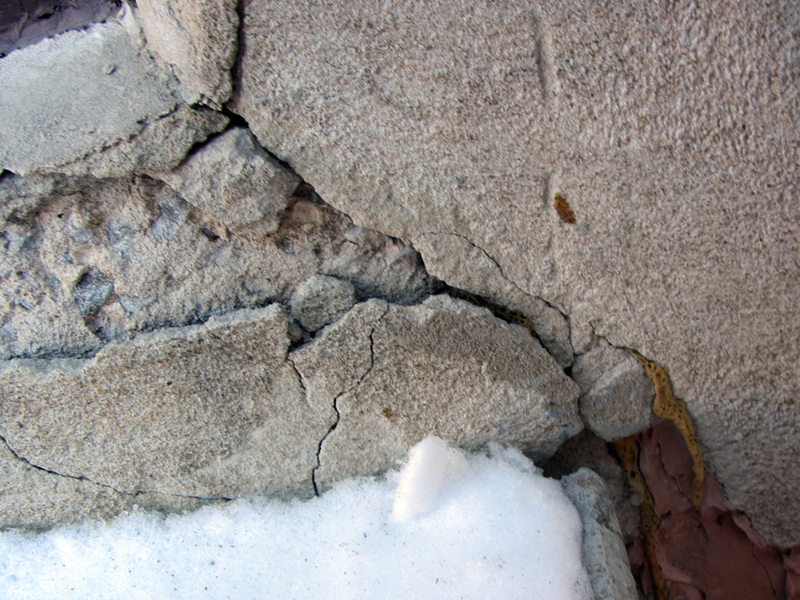 The best method of defence to a leaking foundation is to properly seal or repair the cracks. 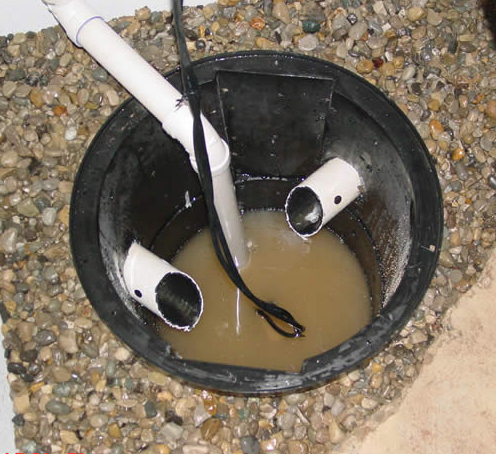 This will greatly reduce the amount of water that may enter the basement. 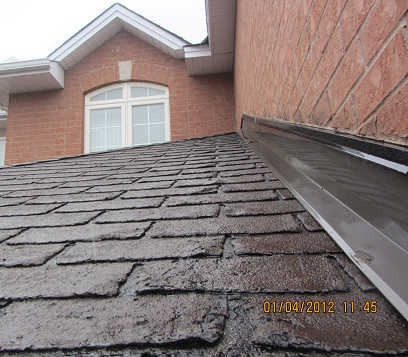 Clean debris from eavestroughs and downspouts. Check for loose or leaky eavestroughs, check that they are clean and free of leaves, branches and other debris that could cause them to clog or overflow. 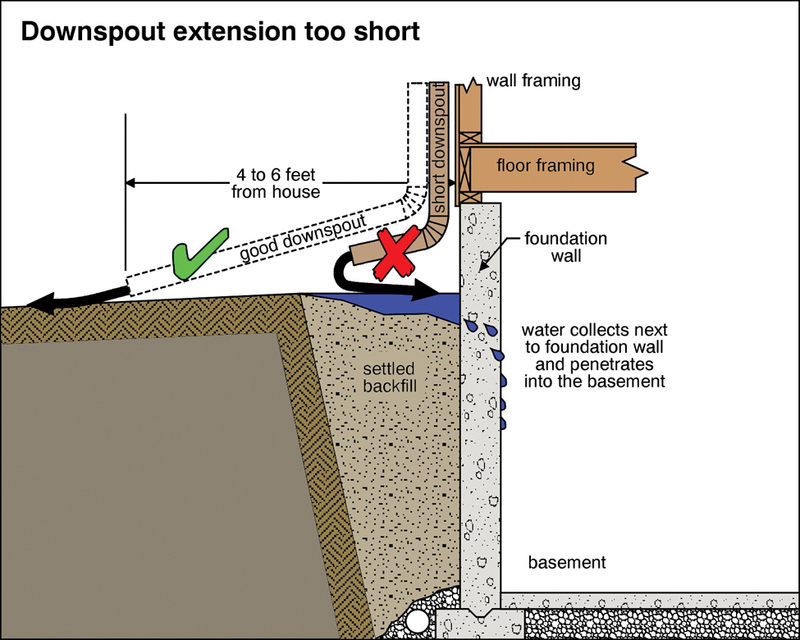 Make sure downspouts drain 4 to 6 feet away from the foundation Poor drainage can lead to water in the basement or crawl space. Remove the cover and schedule service (power on if needed). 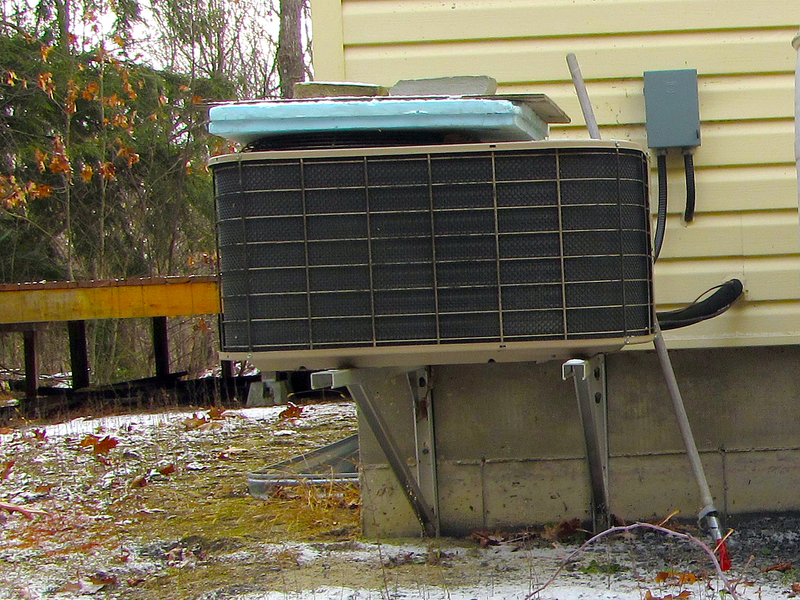 Check the exterior unit coils and clean as required. 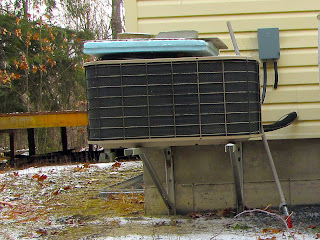 Clean coils will allow the AC unit to operate more efficiently, and an annual service call will keep the system working at peak performance levels. 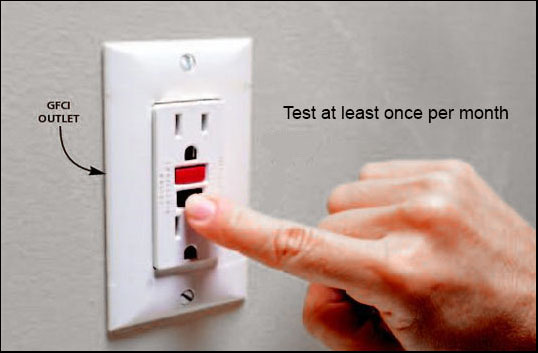 Turn off the power and water; drain and clean filters. Close the bypass damper at the furnace on units with central air conditioning. From the ground, use binoculars to examine the roof shingles to see if any were lost or damaged during winter. 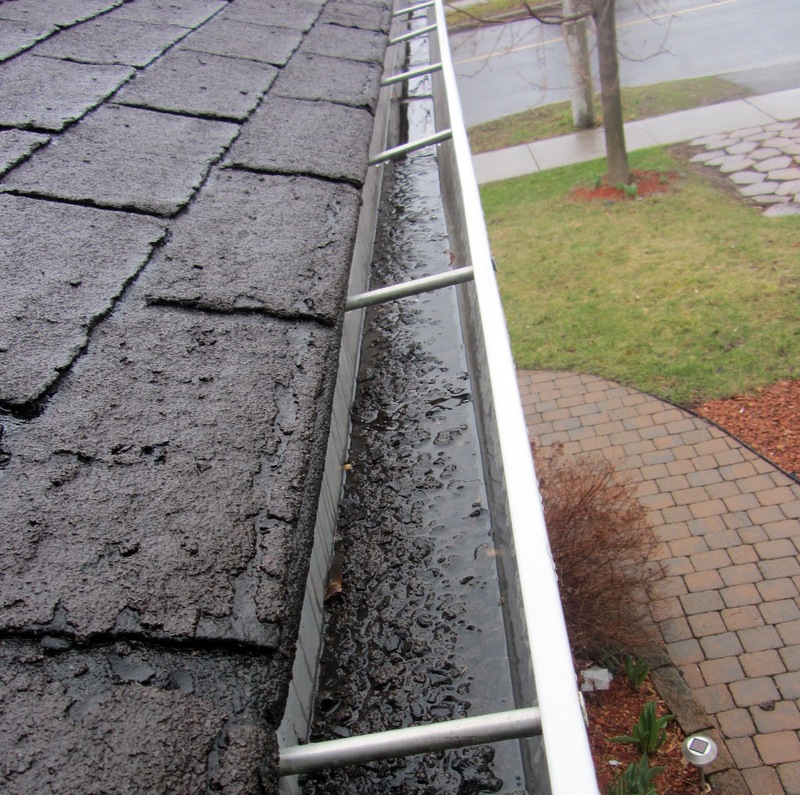 Shingles that are cracked, buckled, loose or are missing granules will need to be replaced. Flashing around plumbing vents, skylights and chimneys should be checked and repaired by a qualified roofing contractor. If your roof looks like the one in the photo above, it`s time to budget for roof replacement. Clean the clothes dryer exhaust vent and space under the dryer. Remove all lint, dust, and pieces of material. 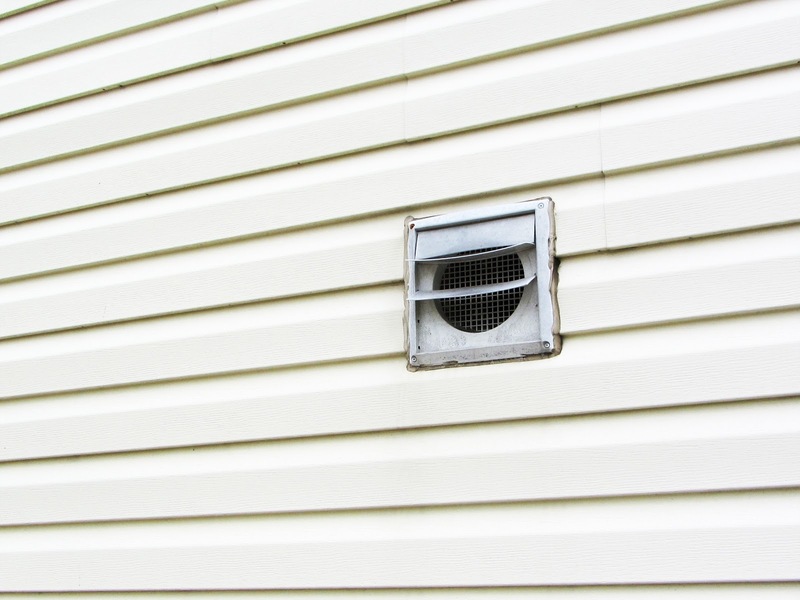 Check the exterior vent cover and replace any broken or missing louvers. 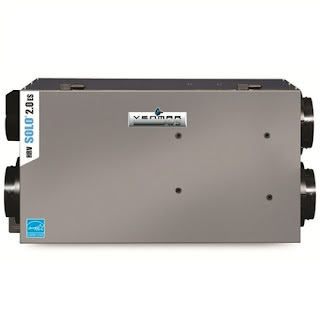 A clogged vent can reduce your dryer’s efficiency and create a fire hazard. 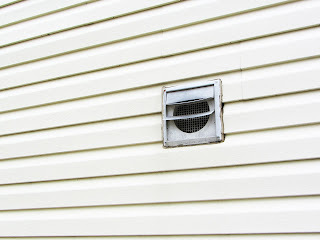 Clean and/or replace the heat recovery ventilator filyrtd as needed. The filters should be cleaned at least every two months. Also check the drain line is free of blockages. 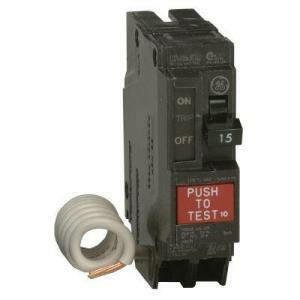 Check your user manual if you are not sure how to do this. Check and repair any cracked, broken or uneven driveways, walkways and patios to provide a safe level walking surface. 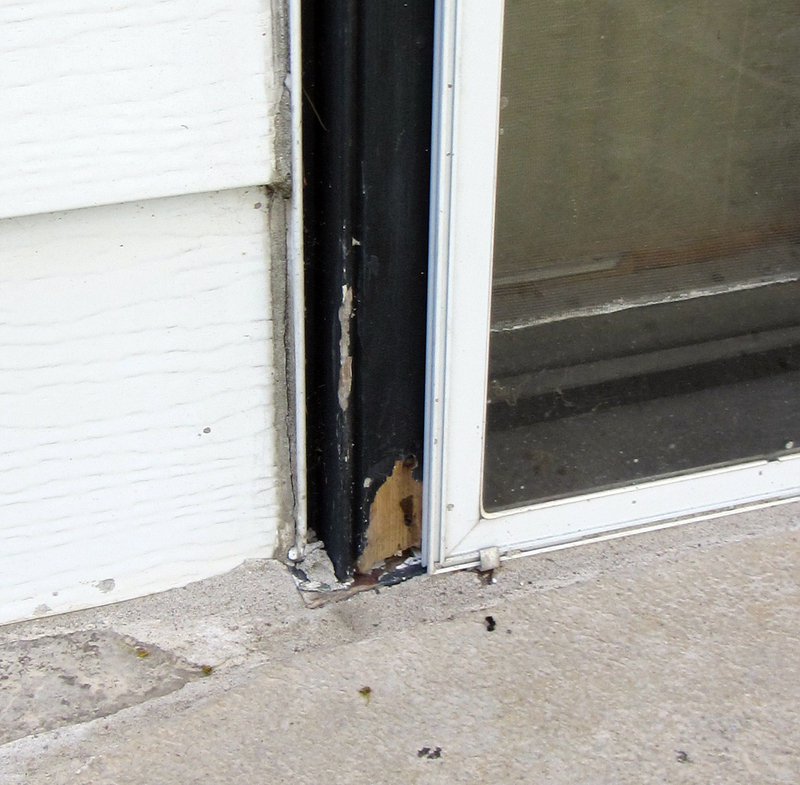 Check the trim around windows and doors. 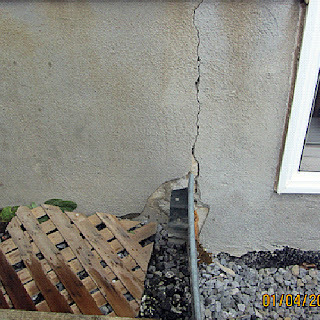 Repair or paint them before the spring rains can do more damage to the exposed wood and openings. Repair loose or missing caulk from around windows and doors. 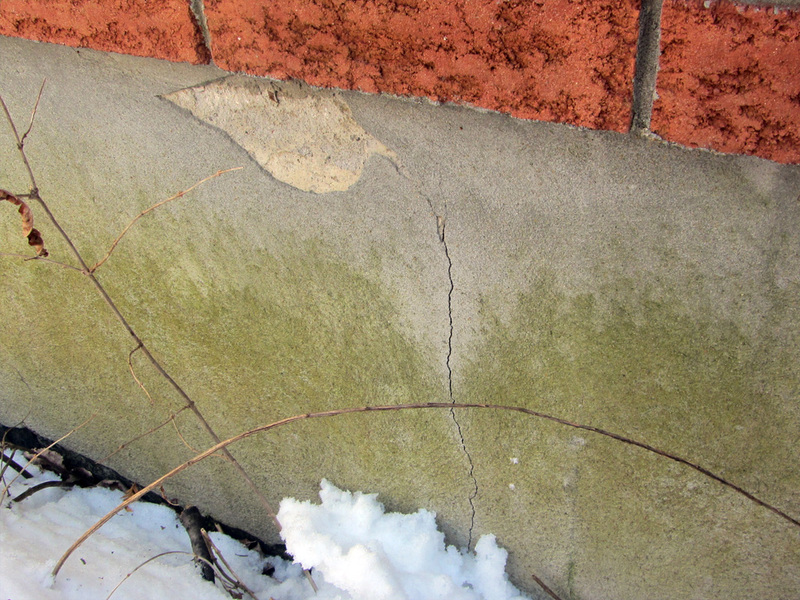 Examine the foundation walls for cracks, leaks or signs of moisture, and repair as required. 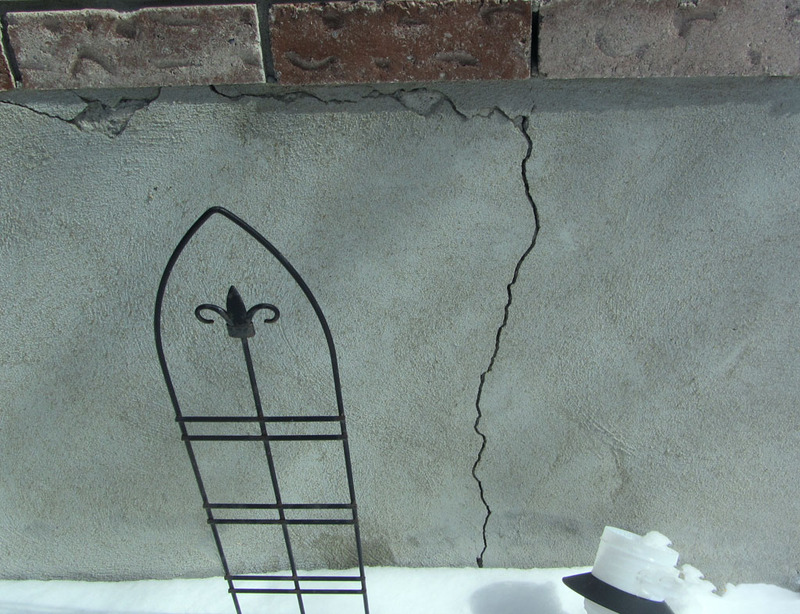 If cracks in the foundation exist, routine caulking won't do the job. You'll want to hire a foundation specialist, who can employ a two-part epoxy injection system that will bond those cracks chemically depending on the size of the crack. If you have a sump pump, ensure sump pump is operating properly before the spring thaw sets in. 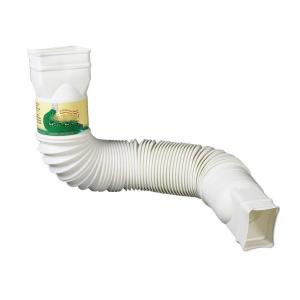 Ensure discharge pipe is connected and allows water to drain 4 to 6 feet away from the foundation. Having a backup ready is a good plan. Once you've finished, sit back, relax, and feel proud of the great work you've done. Inspected by 42 - Home Inspections also provides maintenance inspections. If you want a detailed to do list. Give Barry a call today at 613-799-3698. 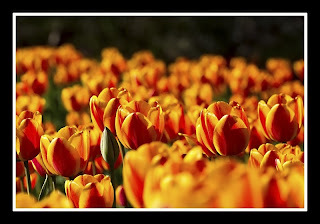 We are now offering a low level photography service, also known as mast photography. Since we often use this pole and remote camera setup to inspect roofs that are not otherwise accessible, we thought we might as well offer the use of it as part of our service offerings. Free-standing kitchen ranges and even built-in ranges can tilt forward when too much weight is placed on an open oven door. This can result in death or serious injuries from being trapped under the range, not to mention scalds and burns caused by hot food and liquids falling from the cook top. This type of accident could happen to anyone, small children and the elderly are especially vulnerable to accidental kitchen range tipping. Parents should supervise children when they are in the kitchen and educate them about the safe use of the range. A small child may stand on an open oven door in order to see what is cooking on the stove top and accidentally cause the entire unit to fall on top of them. Never use the oven door for support or as a step. 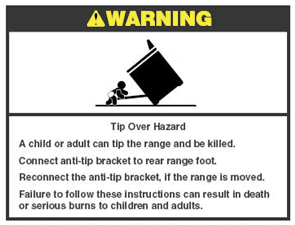 Based on the US Consumer Product Safety Commission (CPSC) reports, there were 143 incidents between 1980 and 2006 that involved kitchen range tip over as a result of not having an anti tip bracket. Thirty three deaths occurred, 19 children, and all 33 deaths were caused by the victim being trapped under the range that fell on them. 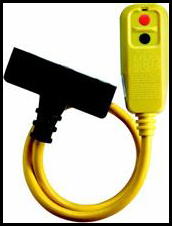 Anti-tip devices became a UL requirement June 3, 1991. For protection against kitchen range tip-over, ensure the anti-tip device (should be included with the range when you buy it) is installed. The kitchen range anti-tip bracket is a single or two piece metal bracket that secures the range to the floor, wall or cabinet and helps prevent it from tipping. Remember to re-engage the anti-tip device if the range is moved for cleaning or repair. 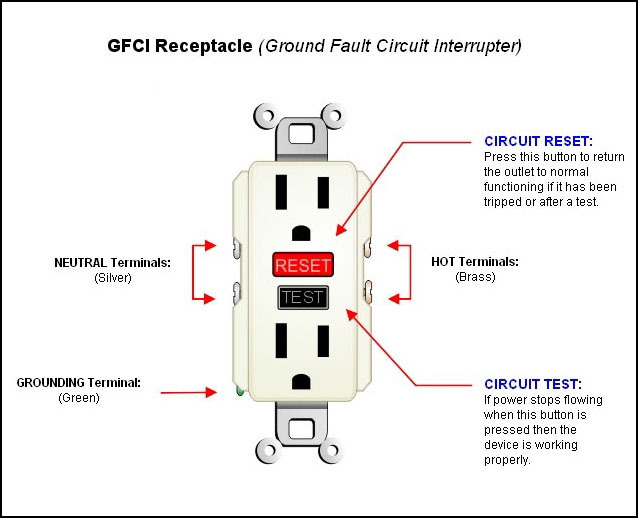 Contact your kitchen range manufacturer, your appliance dealer or an authorized service agent for information and assistance to obtain a replacement anti-tip device. Never use the door as a step stool, seat or as a support for body weight or other objects. Make sure the proper anti-tip device is correctly installed. o some models with removable drawers can be removed and a flashlight can be used to search for the bracket. In response to this danger, the American National Standards Institute (ANSI) and Underwriters Laboratories (UL) created standards in 1991 that require all ranges manufactured after that year to be capable of remaining stable while supporting 250 pounds of weight on their open doors. 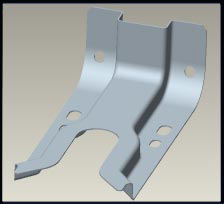 Manufacturers' instructions, too, require that anti-tip brackets provided be installed. Ranges are susceptible to tipping if they are not equipped with anti-tip brackets.